Create your own custom warning line system with Cleasby Roofing separately sold components at Intech Equipment and Supply. Start from the ground up here with the W00075A base, which is designed to affix with slip fit built in connector to the stanchion. Add on to existing systems, outfit new crews with new systems, or start from the beginning right here with Cleasby! The Cleasby Base for a Warning Line System is set on the roof top near to where crews can safely work on the perimeter. The base itself is 24 inches by 24 inches by ¼ inch. Connection is easy with the slip fit design that allows the stanchion to slip right into the base. Spacing should be determined by recommended manufacturer specs, OSHA regulations, the unique circumstances of the job and any other governing factors. Providing a warning line system puts a notification in place for when a worker gets to close to the edge of the building. With the Cleasby Complete Warning Line System, fall prevention is effective and affordable. 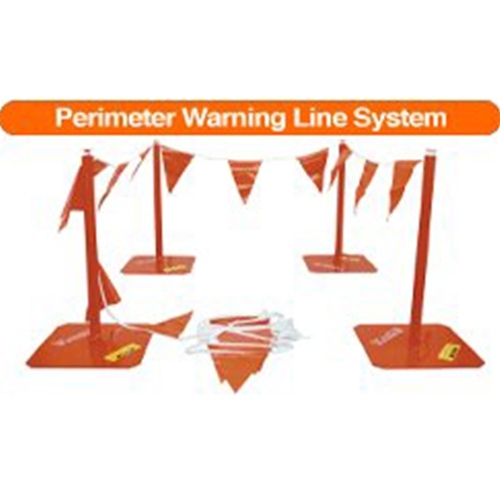 Although not a fall arrest system, a warning line allows workings to focus on the job tasks and when they come close to the edge, the pennant line is typically sufficient notification to break concentration and alert the roofer of potential fall dangers near by. Cleasby makes it quite simple – Choose the full system that includes four bases and four poles, as well as 100 feet of pennant line designed to withstand normal jobsite abuse – Or select a completely custom count by ordering bases, poles and pennant lines separately. Call today to place your order for part or all of the Cleasby Warning Line System, or discuss your unique safety equipment needs with the Intech Equipment and Supply professionals. Keeping safety the top priority on your jobs and ensure both your crew members and your reputation stay protected!